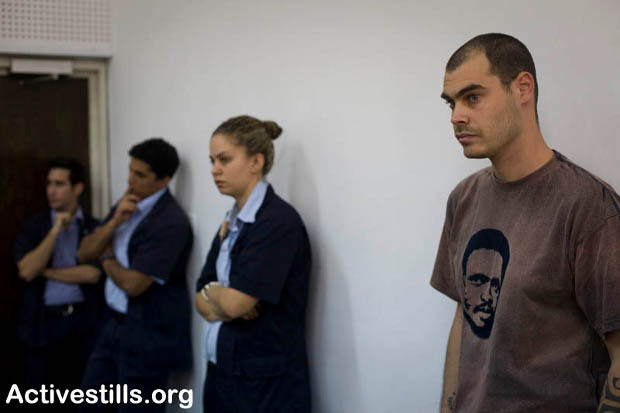 On the 27th December Jonathan Pollak, an Israeli left-wing activist involved with Anarchists Against the Wall and the Palestinian Popular Struggle Coordination Committee, was sentenced to three months jail for, in 2008, riding through Tel Aviv as part of a Critical Mass bike ride protest against the attacks on Gaza. As Joseph Dana points out in this interview, Pollak is the only Israeli being sent to jail for anything to do with these attacks, or with the larger siege of Gaza. On January 31, 2008, some thrity Israeli protesters participated in a Critical Mass bicycle ride through the streets of Tel Aviv against the siege on Gaza. During the protest, Pollak was arrested by plain-clothes police who recognized him from previous protests and because, as claimed in court, they assumed he was the organizer and figurehead of the event. The protest was allowed to continue undisturbed after Pollak’s arrest and ended with no further incidents or detentions. The arrest and subsequent indictment appears to be the result of police vindictiveness, rather than of Pollak’s behavior at the time of the event; Pollak was but one in a group of protesters who behaved exactly like him, yet he was the only one to be singled out. Moreover, environmental Critical Mass events take place in Tel Aviv on a regular basis, but have never been met with such a response. Other protests, which have caused far more severe obstruction of traffic (e.g. the motorcade protest of thousands of motorcycles) did not result in arrests, and surely did not lead to the filing of criminal charges and imprisonment. As said earlier, it is customary at this point of the proceedings to sound remorseful, and I would indeed like to voice my regrets regarding one particular aspect of that day’s events: if there is remorse in my heart, it is that, just as I argued during the trial, I did not play a prominent role in the protest that day, and thus did not fulfill my duty to do everything within my power to change the unbearable situation of Gaza’s inhabitants, and bring to an end Israel’s control over the Palestinians. In the face of this reality, and as a stance against it, we chose on January 31st, 2008, to exercise the freedom of speech afforded to Jewish citizens of Israel. However, it appears that here in our one-of-many-faux-democracies in the Middle East, even this freedom is no longer freely granted, even to society’s privileged sons. I must add that, if His Honor decides to go ahead and impose my suspended prison sentence, I will go to prison wholeheartedly and with my head held high. It will be the justice system itself, I believe, that ought to lower its eyes in the face of the suffering inflicted on Gaza’s inhabitants, just like it lowers its eyes and averts its vision each and every day when faced with the realities of the occupation. So what is happening here? What is happening when riding ones bike in protest becomes an imprisonable offense, at the same time as news comes out that an unnamed inmate held in solitary confinement in Ayalon Prison committed suicide and was then disappeared: no press release, no public naming of the person, no nothing. And, of course, this points to the difference in the ways in which Jews and Palestinians are treated by the Israeli prison/court system. Nameless deaths are substantially different to three months in jail. But together the treatment of these two people points to an incredible failure in Israel to consider people. The London Review of Books has an excellent review of Bush’s new book Decision Points, wherein the reviewer, Eliot Weinberger, asserts that it wasn’t that Bush didn’t care about black people in particular, but that “[o]utside of his family, he didn’t care about people, and Billy Graham taught him that ‘we cannot earn God’s love through good deeds’ – only through His grace, which Bush knew he had already received.” And it seems to me that this holds true in Israel. As though Zionism, as an idea or an ideal, is attached not to people, but only to an idea of supremacy over land. A mixture of blood and land that must be retained at all cost. And whoever stands in the way is to be stopped. So the people stop mattering, or stop being considered as people, and anything can be done to them. And anything is being done to them. It’s terrifying. *and in case you haven’t seen +972 magazine yet, you should definitely have a look and a read – there’s some really amazing writers and activists who put it together, and it’s a great source of information, commentary and analysis.